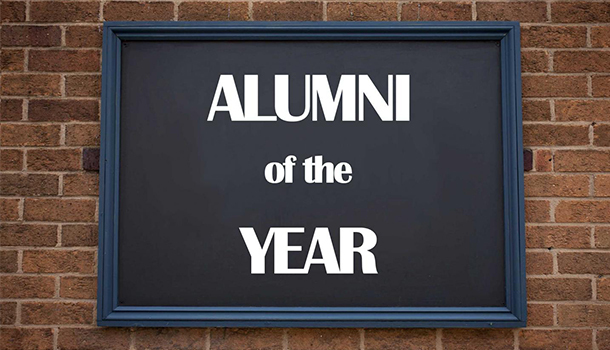 Home News The nomination period for Alumni of the Year Award 2019 is OPEN! Our community of alumni has made a significant impact in the Czech Republic and worldwide. Each year, we recognize one alumnus or alumna who has made an outstanding contribution through the Alumni of the Year Awards. Exceptional achievements shouldn't stay unnoticed, and we believe that our annual Alumni of the Year Awards are an essential part of keeping our alumni network connected to the UNYP community. UNYP Alumni of the Year Award recipients serve as an inspiration for the generations of students who will follow. The University of New York in Prague allows students to discover their potential and become reliable, prosperous and well-educated individuals. We encourage and empower our students to turn their ingenuity into reality and make extraordinary things happen. Our Alumni of the Year must embody these values and will have made a valuable contribution to the University, the community or their professional field. We accept nominations from anyone, including current students and staff and former students and staff. Please follow the link to submit a nomination and read a full list of rules. 1. There is no limitation on who can submit a nomination. 2. There is no limitation on the number of nominations that a single nominator can submit. 3. Self-nominations are allowed and accepted. 4. A nomination will only be accepted if submitted through the online form, which can be found above these rules. 5. A nomination will only be accepted if submitted within the appropriate timeframe for each year of the competition. 6. A nomination will only be valid if the nominee fulfills the eligibility criteria and accepts the nomination. 8. All nominators and their personal data are confidential and are collected for the sole purpose of follow-up inquiries raised by the Award Committee.